Giant Papillary Conjunctivitis is a problem that is concerned with the eyes. Once there is a problem the eyeballs can turn extremely red. 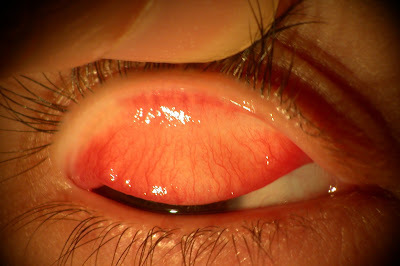 The redness of the eyes can be because of the infection in the membrane. The membrane can swell that can makes it difficult to see properly. The membrane is also known as the conjunctiva. As the name of the disease suggest, there are giant papillae that cause bumps to appear right under the eyelid of the patient. This particular disease can be called as the disease that can cause high amount of the irritation to the patient. Giant Papillary Conjunctivitis is a type of complication that can be associated with the contact lenses. The disease is also known as the induced papillary conjunctivitis (CLPC). There is a basic type of the inflammation that can cause the irritation in the membrane of the eye. This typical membrane is sensitive in nature and can cause various issue to the eye. The hyper sensitive ocular tarsal palpebral conjunctival layer is extremely delicate layer that can get allergy due to excessive use of the lens. It is a type of atopic disease that is found in young people most of the time. Giant Papillary Conjunctivitis is a type of disease that can take some time to develop. In this disease the eyes can have the redness. There is discomfort in eyes due to itching in the eyes. There is a burning sensation that can keep the patient uncomfortable. There is an inflammation in the eye; patients may feel like having a particle inside the eye. Patients may have blur images as well as there is a consistent discharge of water from the eyes. The lens may or may not be at the same position once the eye blinks. Rubbing should be avoided in such type of the situations. Giant Papillary Conjunctivitis can also be termed as the allergic inflammatory response that can be caused by number of factors. When there is a resistance developed between the conjunctiva and implant like the lenses. Low quality lenses may cause the issue to rise. The material of the lens can be one of the causes because there may be chemical used to deposit the lens. There are allergic reactions that can get activated with in appropriate use of the lens. Conjunctiva and mucus membranes are sensitive and anything like the allergen can cause the problems to the eyes. Individuals with the sensitive body immune system can have the same issues. Giant Papillary Conjunctivitis can be treated with the help of management at the various levels. In order to avoid such type of the issue, every individual should avoid having the contact lens for several weeks. The discomfort can be reduced to a considerable level by using cold compressions. There are oral antihistamines that can also be used in order to treat the problem. Corticosteroids can only be suggested if there is a serious issue with the patient. The Immunotherapy can also be used as a way of giving the treatment to the patients. There is a proper care required likewise frequent change of lens is required.